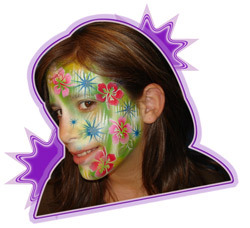 Star Shields is the inventor of airbrush face painting and has over 25 years of experience as an Airbrush Face and Bodyart artist. He provides airbrush classes for beginners and advanced professionals to share his knowledge and expertise with airbrush make up, temporary tattoos and bodyart. Basic Beginners and Advanced classes run 8 hours each. Costs vary according to the number of people taking the class. All equipment and supplies are provided and can be purchased at low prices. Contact Star for more details!